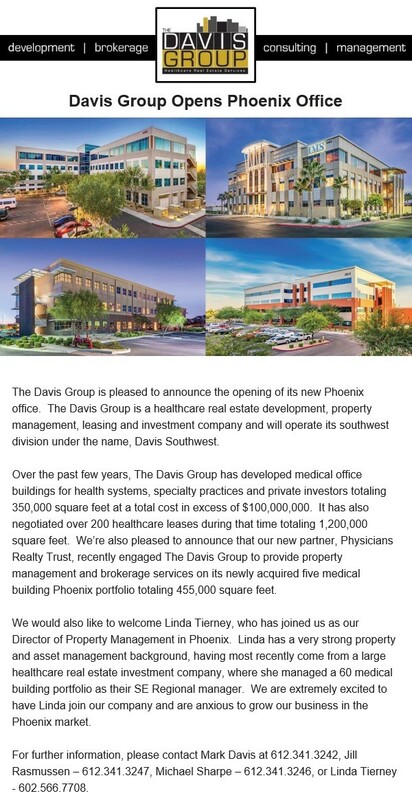 In order to provide more healthcare real estate options to clients in the southwest U.S., Davis has expanded into the Phoenix market. The new office is now open and will be the central point of operation for the company’s southwest division. With a Phoenix medical building portfolio of 455,000 SF, this expansion represents a strong commitment to the Phoenix area. Linda Tierney will serve as the Director of Property Management in Phoenix, AZ bringing strong property and asset management experience that includes the management of a 60 medical building portfolio. Davis is excited for this opportunity to grow our business in the Phoenix market.